With refrigeration equipment under constant use and stress, various components are bound to wear out over time. At Nordic, we understand the importance of getting that equipment back up and running as soon as possible – or better yet, minimizing the frequency of unexpected repairs. 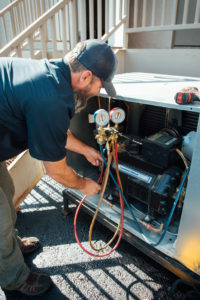 Our team of highly trained technicians have provided commercial refrigeration maintenance and repair services to grocery stores, supermarkets, distribution warehouses, convenience stores, liquor stores, breweries, and restaurants in the Vail Valley since 1987. Whether you need certain equipment fixed in a crunch, or you’re looking for an experienced maintenance professional, you can count on us to get the job done right! With refrigeration equipment under constant use, various parts and components will occasionally wear out. We understand how critical each piece of equipment is to our customers’ businesses. Broken equipment can lead to potential losses, business down-time, unsatisfied customers, and aggravation. That’s why we’re committed to getting our customers’ equipment up and running as soon as possible with a job done right by matching the right technician to the problem. Given the constant stress put on most equipment under normal usage, various parts and components are bound to wear out occasionally. When major components break, we understand that the decision to either repair and replace certain equipment is largely based the cost difference. To help make the decision, Nordic is happy to provide customers with a fair and reasonable quote for major repairs upon request. New equipment giving you problems? Not to worry! Nordic has been an authorized warranty service provider for most refrigeration and kitchen appliance brands in Colorado for decades. We proudly service commercial refrigeration and kitchen equipment along the I-70 corridor in Eagle County, Colorado, as well as surrounding areas. We provide occasional service to the surrounding areas of Garfield, Summit, Lake, and Pitkin Counties, though additional travel charges may apply. Towns within our core service area include Vail, Minturn, Eagle-Vail, Avon, Beaver Creek, Edwards, Eagle, Gypsum, and Glenwood.